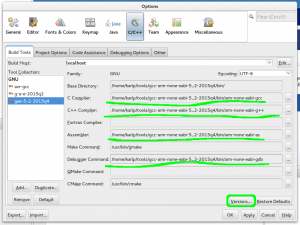 This post supersedes http://false.ekta.is/2012/05/using-netbeans-for-stm32-development-with-stlink-texane/ it has been updated for 2016 and current best software tools. Again, this is only focussed on a linux desktop environment. Advice here hasn’t changed. 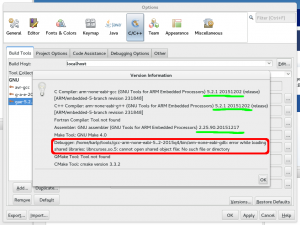 The best toolchain is still gcc-arm-embedded They steadily roll out updates, it’s the blessed upstream of all ARM Cortex GCC work, and it has proper functional multilib support and proper functional documentation and bug reporting. It even has proper multi platform binaries for windows and macs. Some distros are packaging “arm-none-eabi-XXXXX” packages, but they’re often old, repackages of old, poorly packaged or otherwise broken. As of November 2015 for instance, ArchLinux was packaging a gcc 5.2 binary explicitly for arm-cortex, that did not support the -mmcu=cortex-m7 option added in gcc 5.x series. Just say no. I like untarring the binaries to ~/tools and then symlinking to ~/.local/bin, it avoids having to relogin or start new terminals like editing .bashrc and .profile does. ~/.local/bin$ ln -s ~/tools/gcc-arm-none-eabi-5_2-2015q4/bin/arm-none-eabi-* . The internet is (now) full of old articles recommending things like “summon-arm-toolchain” (Deprecated by the author even) “code sourcery (lite)” (CodeSourcery was bought by Mentor, and this has been slowly killed off. Years ago, this was a good choice, but all the work they did has long since been usptreamed) You can even find advice saying you need to compile your own. Pay no attention to any of this. It’s well out of date. Don’t use texane/stlink. Just don’t. It’s poorly maintained, regularly breaks things when new targets are introduced and not nearly as flexible as OpenOCD. It did move a lot faster than OpenOCD in the early days, and if you want a simpler code base to go and hack to pieces for this, go knock yourself out, but don’t ask for help when it breaks. No major changes here, just some updates and dropping out old warnings. You should still setup your toolchain in netbeans first, it makes the autodetection for code completion much more reliable. I’ve updated and created new screenshots for Netbeans 8.1 the latest current release. Put in the “Base directory” of where you extracted the toolchain. In theory netbeans uses the base directory and the “family” to autodetect here, but it doesn’t seem to understand cross tools very well. Which means you’ll have to fill in the names of the tools yourself, as shown below. Click on “Versions” afterwards to make sure it all works. If you’re getting the error about ncurses from gdb, this because newer gdb builds include the curses “tui” interface to gdb in the standard build. (Yay! this is a good thing!) However, as the g-a-e toolchains are all provided as 32bit, you may be missing the 32bit ncurses lib on your system. On Fedora, this is provided in the ncurses-libs.i686 package. $ openocd -f board/stm32ldiscovery.cfg -c "program usb-gadget0-stm32l1-generic.elf verify reset exit"
No need for bin files or anything, there’s a time and a place for those, and if you don’t know and can explain why you need bin files, then elf files are just better in every way. 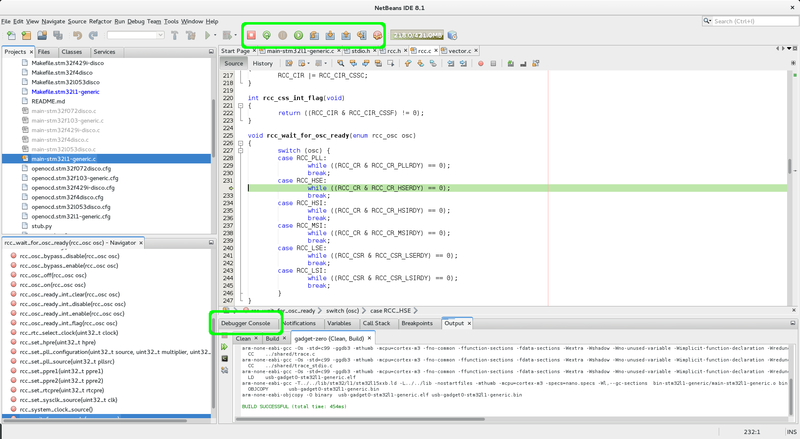 GDB is always going to be a big part of this, but, assuming you’ve got it flashed, either by programming as above, then you can debug in netbeans directly. First, make sure OpenOCD is running again, and just leave it running. 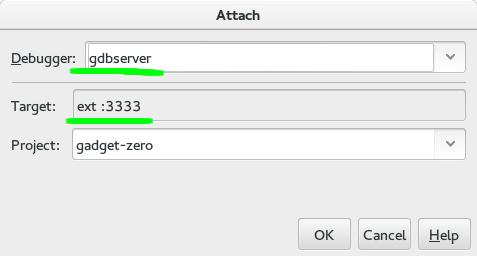 First, install the gdbserver plugin, then choose Debug->Attach Debugger from the menu. Make sure that you have the right project selected. There’s a bug in the gdbserver plugin that always forgets this. At this point, “nothing” will happen. If you look at the console where OpenOCD is running, you’ll see that a connection was received, but that’s it. If you now set a breakpoint on “main” or anywhere early and press the “Restart” icon in the top, OpenOCD will restart your process from the top and stop at the first breakpoint. Yay! If restart fails, make sure you used “extended-remote” for the target! If you click the “Debugger console” window, you can actually flash your code here too. 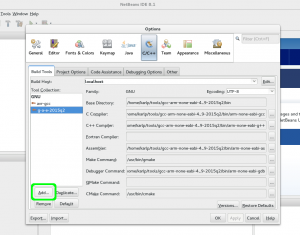 Leave the debugger running! (No need to stop the debugger to rebuild) Make a change to your code, rebuild it, and then, on the “Debugger console” just enter “load” and press enter. You’ll see the OpenOCD output as it reflashes your device. 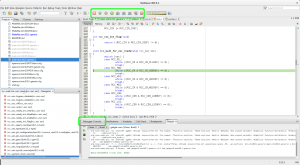 As soon as that’s done, just hit the “Restart” icon in netbeans and start debugging your new code! Oh look! again! Remember kids, it’s not just compilers that you should keep around, but libc/binutils, and all libraries you’re ever going to use. Ahh, it’s always the right thing to do, but normally it’s so heavy to check in things like GCC/Binutils versions into every project. It’s the sort of thing you do if you’re a big serious company, working on big serious things, with big serious support. Besides, I’m not relying on anything weird or esoteric right? AKA A surprising thing that happened to me while porting Contiki to the STM32F1. I already have a STM32L1 port working (for the basic uses of Contiki) and the major difference with this port is that it should support pretty much any target that libopencm3 supports. So I made a new platform and tweaked the GPIO settings for the STM32F1, and flashed it to my STM32VL Discovery board, and…. it started, but then it crashed. Ok, some bit in the top 16bits. That’s the Usage Fault Status Register(UFSR). Let’s look at it a little closer because I can’t count hex digits in my head as well as some people. Ok. That bit means, Unaligned access UsageFault. Awesome. One of the big selling points of ARM Cortex-M is that it doesn’t care about alignment. It all “just works”. Well, except for this footnote: "Unaligned LDM, STM, LDRD, and STRD instructions always fault irrespective of the setting of UNALIGN_TRP" Ok, so let’s see what caused that. GDB “up” two times to get to the stack frame before the signal handler. x /i $pc is some magic to decode the memory at the address pointed to by $pc. Check it out. There’s an ldm instruction. And r3 is clearly not aligned. (It doesn’t even look like a valid pointer to SRAM, but we’ll ignore that for now) Ok, so we got an unaligned access, and we know where. But what the hell?! Let’s look at the C code again. That t->timer is all struct stuff. Perhaps there’s some packed uint8_ts or something, maybe some “optimizations” for 8bit micros. Following the chain, struct etimer contains a struct process, which contains a struct pt which contains a lc_t. And only the lc_t. Which is an unsigned short. I guess there’s some delicious C rules here about promotion and types and packing. There’s always a rule. Changing the type of lc_t to an unsigned int, instead of a short and rebuilding stops it from crashing. Excellent. Not. It does make the code a little bigger though. I’m still not entirely sure of the best way of proceeding from here. 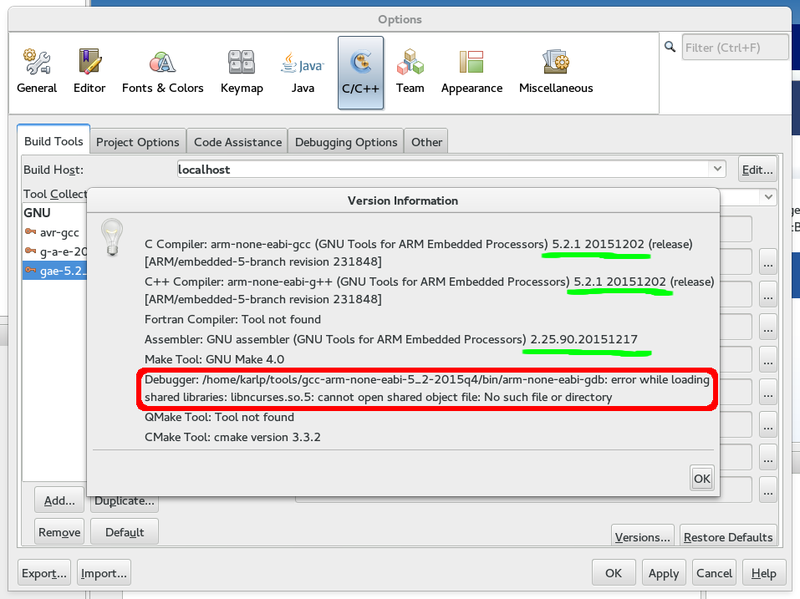 I’m currently using GCC version arm-none-eabi-gcc (GNU Tools for ARM Embedded Processors) 4.7.3 20121207 (release) [ARM/embedded-4_7-branch revision 194305], and I should probably try the 4.7-2013-q1-update release, but if this is deemed to be “user error” then it’s trying to work out other ways of modifying the code to stay small for everyone where possible, but still work for everyone. Not entirely what I’d planned on doing this evening, but someone enlightening at least. When I fixed my stupid error earlier, I got stdout/printf working. I then poked a lot of simple examples and started to understand how to write simple contiki apps using protothreads. It’s really pretty simple, as long as you remember that it’s all done with switch/case magic, so you can’t use stack variables the way you might expect. This is ok. This makes you think more about where you data lives and what you’re passing around. With stdout working though, I started to go through what else was needed. Contiki offers ~4 different apis for doing things at some point in time. ctimers, etimers, stimers and rtimers. (And also with the clock_* api, which are for when you reallllllly want to do some busy waiting. Don’t do that!) This wiki page was very helpful in understanding the differences, and even having some “porting guide” information. This is an area I feel contiki is very weak in, the almost complete lack (to my eyes) of a porting guide. There’s quite a few different ports in the tree, but they’re often implemented in quite radically different ways, and some of them appear to be unmaintained. But, the good thing about all these timers, is that’s all core. Your port only needs to implement clock.c, and it’s basically all taken care of! Neat! Except rtimers. rtimers are the realtime timers, used for turning radios on and off at the right times to synchronize. When I get to the radio (soon) I’ll be looking at other implementations and seeing what’s best. // these are all commands the shell can run. Note that serial-shell is actually just a wrapper around the shell app. Ok, so you got a shell application built and flashed. But… it doesn’t work! I ran into two problems here. One of them was very well documented, I just didn’t read it. I was used to having to implement newlib syscalls like _read() and _write(), but you actually need to not implement _read(), and make sure you just follow the directions!. Unfortunately, in my case, this wasn’t enough. I could run my application with the native target, but not on my stm32. Again, reading the documentation, contiki processes serial input line by line, looking for a line feed (hex 0xa) to mark the end of line, and completely ignoring carriage return characters (hex 0xd) With gdb I could see that on the native platform, entering a command and pressing “enter” sent only a LF character, and it worked. With picocom and a USB-serial adapter to my board, I was seeing only a CR character, which was ignored. Wikipedia has a lot to say about this, and some of the helpful people on ##stm32 pointed out that this was because my serial device was in “cooked” mode, and I could put it back to raw mode to send the “right” characters. Turns out lots of terminal software has to deal with this, and miniterm.py (Something I just happened to have installed anyway) by default does the “right thing” (or the other thing) There were some suggestions that contiki should probably be more flexible in it’s input, and deal with both either, or, and both, but not require a specific one. That’s a future debate, but not one I’m battling now. But, all’s well that ends well. At this point I have what’s a pretty complete port of the core of contiki to the STM32L discovery board, and all the code that is common for any stm32 (and mostly, any chip using libopencm3) is in the cpu section of contiki, rather than the platform code. Now, it’s just time to start the radio drivers, and work out the best way of implementing the rtimers! My Platform port: https://github.com/karlp/contiki-outoftree This is all you need to target the STM32L discovery, it includes my changes to Contiki, as well as libopencm3 as git submodules. In a previous post I got to a compiling and linking build for the STM32L Discovery board, but it didn’t actually print anything. Turns out I’d made one of the classically common mistakes with STM32 development, and one of the weakpoints in libopencm3’s api for the RCC module. When I actually turned on the USART peripheral, everything started working as I expected. I can’t believe how often I’ve done something like this. Or how often I’ve simply not turned on what I needed. Later, I added code to support USART2 and USART3, but…. didn’t turn on those peripherals. Silly me. Much more to come! Radio drivers and more examples and onwards! I was looking for a few bytes extra flash today, and realized that some old AVR code I had, which used uint8_t extensively for loop counters and indexes (dealing with small arrays) might not be all that efficient on the STM32 Cortex-M3. So, I went over the code and replaced all places where the size of the counter wasn’t really actually important, and made some comparisons. I was compiling the exact same c file in both cases, with only a type def changing between runs. I would personally say that it looks like ARM still has some work to go on optimizations. If _least8 and _fast8 take up more space than int it’s not really as polished as the avr-gcc code yet. For me personally, as this code no longer has to run on both AVR and STM32, I’ll just use int. So, after extending this a bit, my original conclusion about the fast_ types not being fully optimized with arm-gcc were wrong. It’s more that, on AVR, your “don’t care” counters should be unsigned for smaller size, while on STM32, they should be signed (Though I still think it’s dodgy that int_least8_t resulted in bigger code than int_fast8_t) Also, even if signed is better in the best case, the wrong signed is also the worst case. Awesome.